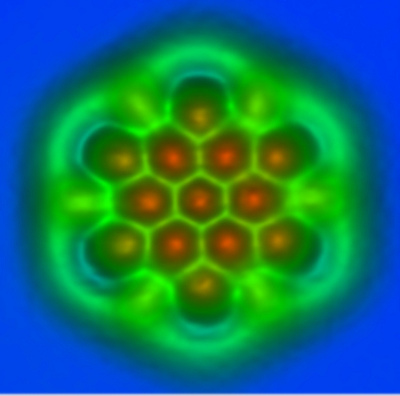 Zurich, Switzerland - September 14, 2012 - IBM (NYSE: IBM) scientists have been able to differentiate the chemical bonds in individual molecules for the first time using a technique known as noncontact atomic force microscopy (AFM). 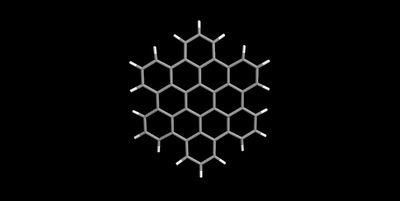 The results push the exploration of using molecules and atoms at the smallest scale and could be important for studying graphene devices, which are currently being explored by both industry and academia for applications including high-bandwidth wireless communication and electronic displays. Leo Gross, scientist, IBM Research - Zurich looking at an atomic force microscope. Courtesy of IBM Research – Zurich. September 12, 2012. IBM (NYSE: IBM) scientists have been able to differentiate the chemical bonds in individual molecules for the first time using a technique known as noncontact atomic force microscopy (AFM). 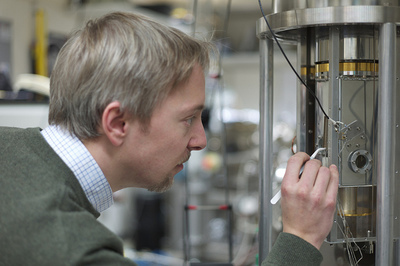 Fabian Mohn of the Physics of Nanoscale Systems group at IBM Research – Zurich. 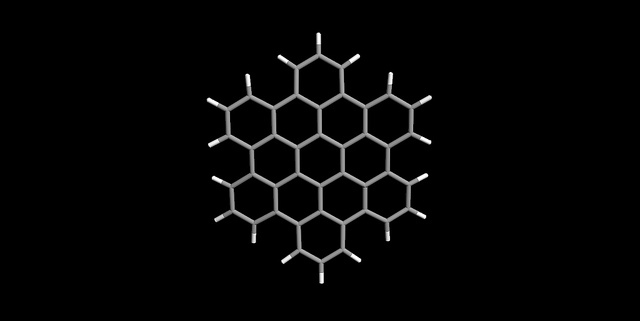 The results push the exploration of using molecules and atoms at the smallest scale and could be important for studying graphene devices, which are currently being explored by both industry and academia for applications including high-bandwidth wireless communication and electronic displays. 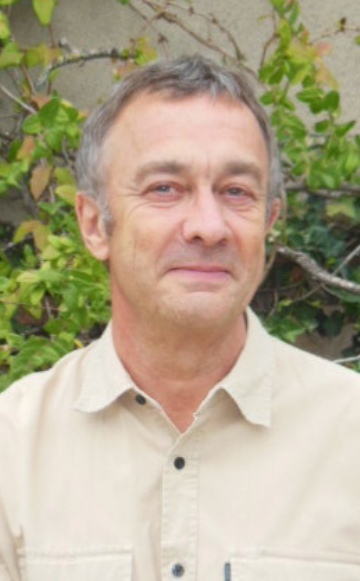 Andre Gourdon, Directeur de Recherche, Centre National de la Recherche Scientifique (CNRS) in Toulouse. "We found two different contrast mechanisms to distinguish bonds. The first one is based on small differences in the force measured above the bonds. We expected this kind of contrast but it was a challenge to resolve," said IBM scientist Leo Gross. "The second contrast mechanism really came as a surprise: Bonds appeared with different lengths in AFM measurements. With the help of ab initio calculations we found that the tilting of the carbon monoxide molecule at the tip apex is the cause of this contrast." From left: Enrique Guitián, Alejandro Criado and Diego Peña with a model of the molecule we have prepared (DBNP) in our hands in front of the CIQUS entrance. From left: Diego Peña, Alejandro Criado and Enrique Guitián with a model of the molecule we have prepared (DBNP) in our hands in the CIQUS lab. The PAHs were synthesized by Centro de Investigacion en Quimica Bioloxica e Materiais Moleculares (CIQUS) at the Universidade de Santiago de Compostela and Centre National de la Recherche Scientifique (CNRS) in Toulouse. A scheme with the route to prepare DBNP from naphthalene and phenanthrene. The individual bonds between carbon atoms in such molecules differ subtly in their length and strength. All the important chemical, electronic, and optical properties of such molecules are related to the differences of bonds in the polyaromatic systems. Now, for the first time, these differences were detected for both individual molecules and bonds. This can increase basic understanding at the level of individual molecules, important for research on novel electronic devices, organic solar cells, and organic light-emitting diodes (OLEDs). 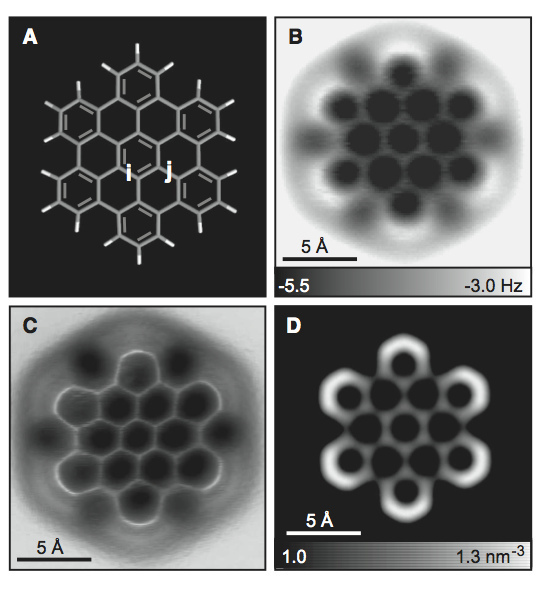 A nanographene molecule exhibiting carbon-carbon bonds of different length and bond order imaged by noncontact atomic force microscopy using a carbon monoxide functionalized tip. 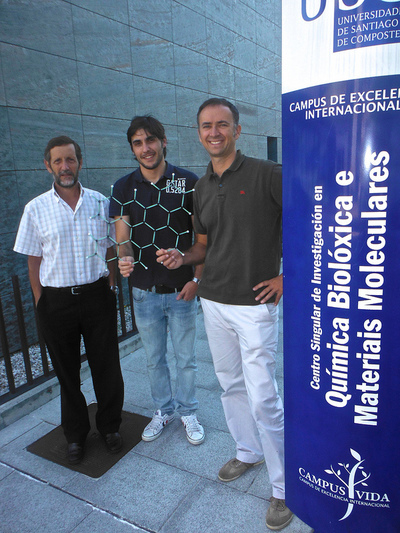 This molecule was synthesized by Centro de Investigación en Química Biolóxica e Materiais Moleculares (CIQUS) at the Universidade de Santiago de Compostela. In particular, the relaxation of bonds around defects in graphene as well as the changing of bonds in chemical reactions and in excited states could potentially be studied. As in their earlier research (Science 2009, 325, 1110) the IBM scientists used an atomic force microscope (AFM) with a tip that is terminated with a single carbon monoxide (CO) molecule. 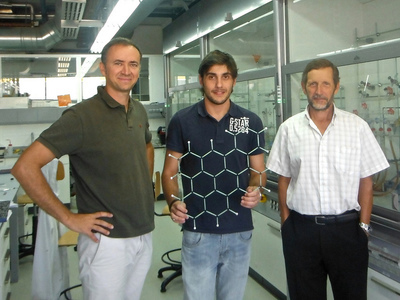 This molecule was synthesized at the Centre National de la Recherche Scientifique (CNRS) in Toulouse. This tip oscillates with a tiny amplitude above the sample to measure the forces between the tip and the sample, such as a molecule, to create an image. The CO termination of the tip acts as a powerful magnifying glass to reveal the atomic structure of the molecule, including its bonds. 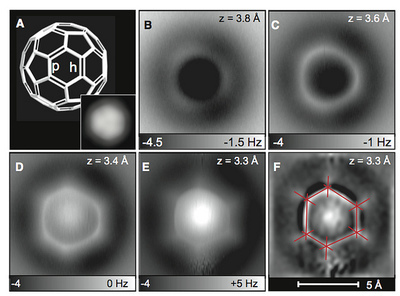 (A) and constant- height AFM measurements (A = 0.35 Å) on HBC on Cu(111) at z = 3.7Å (B) and 3.5 Å (C). In (C), a pseudo-3D representation is shown to highlight the local maxima. (D) Calculated electron density at a distance of 2.5 Å above the molecular plane. Note that i bonds are imaged brighter (B) and shorter (C) compared with j bonds (22). Courtesy of IBM Research – Zurich. This made it possible to distinguish individual bonds that differ only by 3 picometers or 3 × 10-12 meters, which is about one-hundredth of an atom's diameter. In previous research the team succeeded in imaging the chemical structure of a molecule, but not the subtle differences of the bonds. (A) C60 model. The bonds fusing a pentagon and a hexagon (p) are of smaller bond order compared with the bonds fusing two hexagons (h). (Inset) STM image (sample bias V = 0.2 V, current I = 2 pA, size 24 by 24 Å2). The molecule and tip are identical to those in (B) to (F). (B to E) AFM measurements showing frequency shift at different tip heights z (27) above C60/Cu(111) using a CO-functionalized tip. Image size 10 by 10 Å2, oscillation amplitude A = 0.36 Å, V = 0 V.
(F) Laplace- filtered and flattened image of (E), used to measure the apparent bond length L′ (22). Discriminating bond order is close to the current resolution limit of the technique and often other effects obscure the contrast related to bond order. Therefore the scientists had to select and synthesize molecules in which perturbing background effects could be ruled out. To corroborate the experimental findings and gain further insight into the exact nature of the contrast mechanisms, the team performed first-principles density functional theory calculations. Thereby they calculated the tilting of the CO molecule at the tip apex that occurs during imaging. Model (A) and constant-height AFM measurements of DBNP on bilayer NaCl on Cu(111) (33) at z = 3.6 Å (A = 0.48 Å) (B and C). A pseudo-3D representation of (B) is shown in (C) to highlight the bonds. They found how this tilting yields a magnification and the very sharp images of the bonds. This research was funded within the framework of several European projects including ARTIST, HERODOT, CEMAS, the Spanish Ministry of Economy and Competitiveness and the Regional Government of Galicia. Animation showing the last cooper atom of the tip of the Atomic Force Microscope (top) where a carbon-monoxide molecule are terminated. The carbon atoms are blue and the oxygen atom is red. 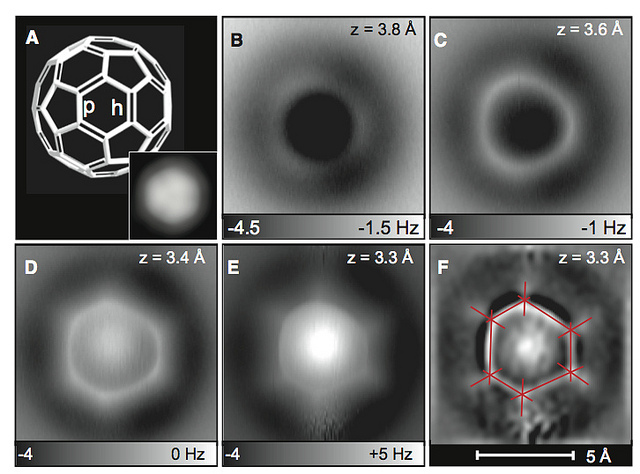 This tip oscillates with a tiny amplitude above the C60, known as a buckyball, and the forces are measured between of the two molecules, to create an image. The carbon-monoxide termination of the tip acts as a powerful magnifying glass to reveal the atomic structure of the molecule, including its bonds. 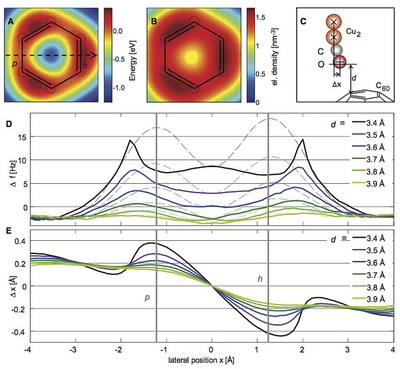 The scientific paper entitled "Bond-Order Discrimination by Atomic Force Microscopy" by L. Gross, F. Mohn, N. Moll, B. Schuler, A. Criado, E. Guitian, D. Pena, A. Gourdon and G. Meyer, appears in Science (14 September 2012). 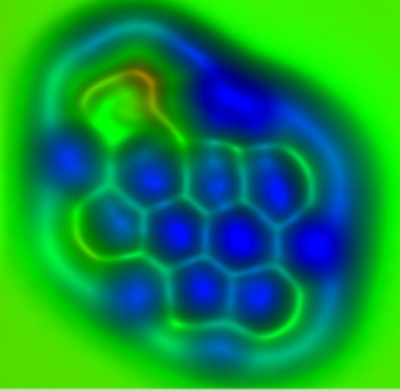 Video Animation: Hexabenzocoronene model fades into the AFM image revealed by IBM scientists. Scientists have been striving to "see" and manipulate atoms and molecules to extend human knowledge and push the frontiers of manufacturing capabilities to the nanometer regime. IBM has been a pioneer in nanoscience and nanotechnology ever since the development of the scanning tunneling microscope in 1981 by IBM Fellows Gerd Binnig and Heinrich Rohrer at IBM Research – Zurich. For this invention, which made it possible to image individual atoms and later on to manipulate them, Binnig and Rohrer were awarded the Nobel Prize in Physics in 1986. The AFM, an offspring of the STM, was invented by Binnig in 1986. The STM is widely regarded as the instrument that opened the door to the nanoworld. A new facility for world-class collaborative nanoscale research, the Binnig and Rohrer Nanotechnology Center was opened last year on the campus of IBM Research – Zurich. The Center is part of a strategic partnership in nanotechnology with ETH Zurich, one of Europe's premier technical universities. View this timeline highlighting 30 years of nanotechnology at IBM Research.